The Canada Media Fund (CMF) and Quebecor Fund are collaborating on a new pilot partnership to promote the export of content made in Canada. The Canada Media Fund (CMF) has unveiled a co-development incentive with the Mexican Film Institute and reopened its program for the development of audiovisual projects with the Broadcasting Authority of Ireland. The Canada Media Fund (CMF) is a unique private-public partnership created to support television and digital media production in Canada. The Canada Media Fund (CMF) has invested C$10.5 million ($8.4 million) in 43 projects that applied for funding through the 2017-18 Convergent Digital Media Incentive. The Canada Media Fund (CMF) and NZ On Air have renewed their partnership to encourage the co-production of digital media content between creators from Canada and New Zealand, which is currently in its fourth year. The Canada Media Fund (CMF) and South Africa's National Film and Video Foundation (NFVF) have inked an agreement to establish a dedicated incentive for the co-development of audiovisual projects between Canadian and South African producers. According to Canada Media Fund's (CMF) bilingual annual report for the 2016-17 fiscal year, every dollar of CMF investment generates four dollars in production activity. The Canada Media Fund (CMF) and Colombia's Proimágenes and MinTIC have revealed the recipients of nearly C$300,000 ($240,000) in funding through the Canada-Colombia co-development incentive for web series and other digital media projects. 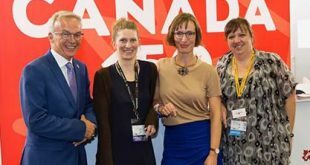 The Canada Media Fund (CMF) has inked a deal with Medienboard Berlin-Brandenburg (MBB) to establish an incentive for the co-development and co-production of digital media projects between Canadian producers and German producers based in Berlin-Brandenburg.